Upon purchasing my SodaStream, one of the first flavors we purchased was Cranberry-Raspberry. As I am not a huge fan of soda, this was right up my ally. Plus, it sounded like it would make a great mix with vodka! Only 35 calories for a 8oz portion is almost equivalent to a guilt free yummy drink without a ton of added sweeteners. Plus I wouldn't have to worry about having fresh soda water on hand and I could control how sweet my drink was. 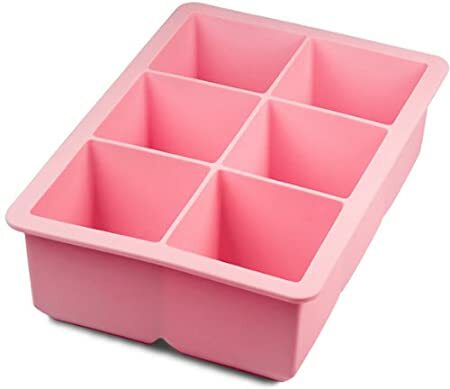 I also recently purchased a Tovolo King Ice Cube Silicone Tray (in pink of course). I got this to do multiple frozen items in, from Greek yogurt cubes to fruit ice cubes. For this recipe, I made lime and raspberry ice cubes. I simply took spring water, fresh lime juice and 5 raspberry's. Froze for 12 hours and voila, I had these amazing ice cubes that made me feel extra pretty while drinking my concoction! Plus, as the ice melted, it added to the flavor of the drink, instead of watering it down. I love making fruit ice cubes - so much better than diluting your drink with water!